OUR BIG 70th ISSUE! Could it possibly be that we have reached our 70th issue, and we're not even breathing hard? That is due to the pantheon of terrific contributing artists and photographers, story tellers and collectors who have made this job such a pleasure that it is. And this website which we think is wonderfully created and maintained by our official webmaster, Jim Clouse. Seventy issues, moving forward directly toward that highwater mark set by Tom Terry and PFPC so long ago. 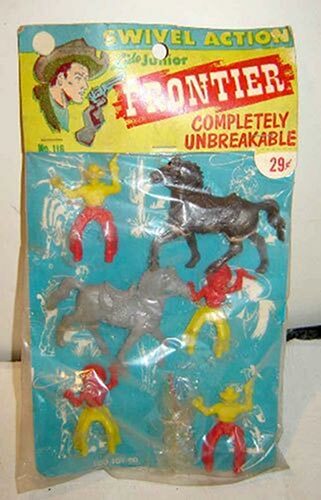 It was in 2001 that PFPC went out of business. We all tend to think of Western Towns, we think of Louis Marx & Companys undeniable bar-setting 4200- series sets: Western Towns, Wyatt Earp Western Towns, Gunsmoke, the 4257 Roy Rogers Western Town, and many more that just sizzle as the hottest, greatest toys of their day. This issue, Playset Magazine and our great contributors and content authorities explore the sets you rarely see, the sets from the long - gone competitors to Marx. 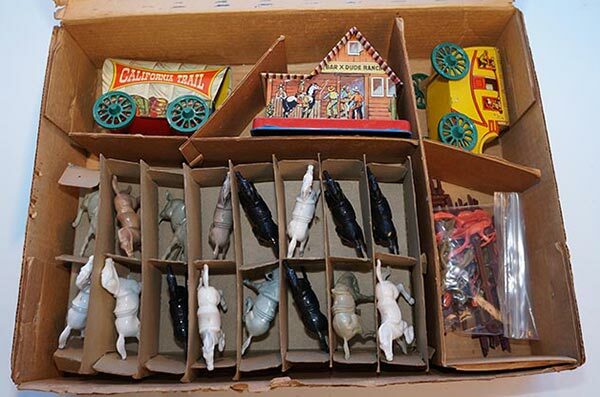 These are the alternative sets, and with them we bring you the Alternative History of the Western Town. This landmark record setting issue goes deep into the sets from Plasco, Archer, Lido, Ideal and Auburn, from MPC, many of them displayed in rare mint sets and mint cartons. This issue we are also featuring Auburns' The Big Valley, playset, a Civil War Sesquicentennial, and charming images of what happens when collect ors get together. You'll see mint store displays, fresh sets and new ideas, plus more of the ads you rely on from your favorite dealers, and lots more. 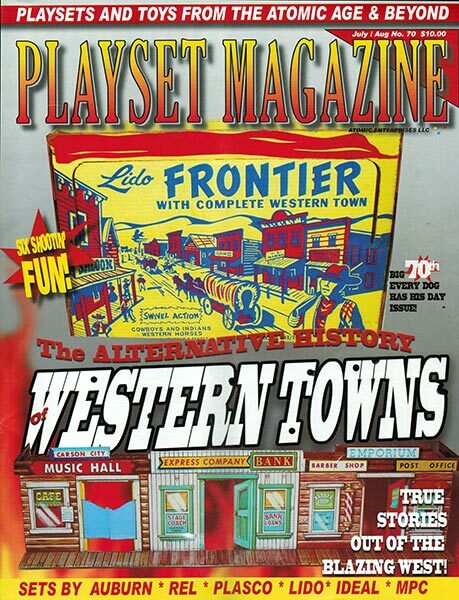 It's time to walk the streets of the Old West -- the alternative West, right in the comfort of your own home with Playset Magazine. Thanks for making us a part of your collection.